Well, what do you know, the Larry H. Miller Tour of Utah is all grown up. What began as a local stage race centered around Thanksgiving Point in Lehi is now entering its tenth year and is undeniably a part of the American and international cycling fabric. But that growth didn’t come without a few pains along the way. From a local race featuring almost exclusively local racers to an international field featuring Grand Tour winners, the Tour of Utah – especially after it was acquired by the Larry H. Miller sports properties – saw its future secured by a strategically slow growth pattern. It is, event organizers say, a move that has not only helped the race survive, but thrive as it has developed into “America’s Toughest Stage Race” with courses that thrill the eyes as much as they strain the legs. The 2014 version of the Tour of Utah is a celebration of the race’s coming of age. Starting in Cedar City on August 4, the Tour of Utah will cross Southern Utah’s red rock landscape before heading north to traverse the Wasatch Front’s classic canyons and valleys. Along the way, a few hundred thousand spectators will cheer the peloton along as they race for the glory to be found at each finish line as well as in Park City when the race concludes on August 10. As one would expect as something ages, it gets bigger – better, even. For 2014, the Tour of Utah has sprouted in two ways. A seventh stage was added to the race and the race is crossing the state border for the first time with a trip to Evanston, Wyoming. Partners from inside the state and across the country have joined forces with Larry H. Miller Sports Properties to help ensure the race’s long term success. 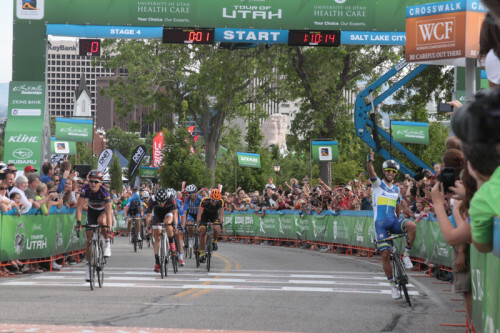 The Utah Sports Commission has provided critical funding and marketing support to assist in the Tour of Utah’s growth. But a moderate approach to growing the Tour of Utah does not mean the race is cutting corners. Rather, the Tour of Utah has spread its wings by design. After the Larry H. Miller companies acquired the race, a hub-and-spokes approach to implemented. This created a central headquarters for the race with individual stages radiating (for the most part) from the Salt Lake City hub. This allowed the race to minimize operating expenses by not requiring massive transfers of equipment, personnel, teams and other infrastructure. But as the race matured, so did the operating plans and budget. In 2013, the Tour of Utah migrated south for a pair of stages. Those stages remain in 2014 with some modification but this year’s race is taking its show on the road to new extents with the added seventh stage and a Stage 5 start in Evanston that carries the peloton over the Bald Mountain Summit in the Uinta Mountains. Also part of the race’s growth is the addition of the Tour of Utah Women’s Edition to be held in conjunction with Stage 3 on August 6 at Miller Motorsports Park. 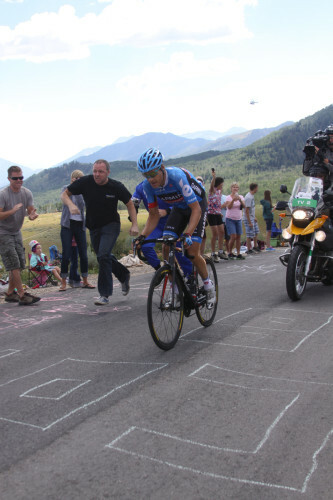 The Larry H. Miller Tour of Utah may be a mature, internationally respected event. But that does not mean the organization is satisfied. With a legacy to maintain, the event hopes to grow in future years with additional stages, more venues and partnerships with other American stage races to create an even stronger professional cycling calendar in the western hemisphere.